Deputy Chief Minister Kavinder Gupta, Union Minister of State in PMO Dr Jitendra Singh along with Minister of State for Education and Tourism, Shakti Parihar, MLA Bhaderwah Daleep Singh Parihar and legislator Ravinder Raina today visited Bhaderwah and inaugurated Multi specialty Medical camp organised by Army under Sadhbhanvna at Sub-district hospital Bhaderwah.The Ministers were accompanied by DG Armed Forces Medical (AFM) Vipin Puri, Major General Rajiv Nanda, DDC Doda Bhawani Rakwal, SSP Shabir Ahmed, Brigadier Narindra Kotwal, Col 4 RR, DD Pandey besides other officers of district and police administration.Dy CM in his speech asked the people of the area to take full advantage of the medical services being provided during the camp and assured the people that the Govt will look into the modalities of placing adequate staff and modern equipment in Sub district hospital Bhaderwah so that better health care is provided to people of rural areas with reduction in the number of referrals cases to super-speciality health institutions.Dr Jitendra Singh congratulated the Army for taking such initiatives and organising a medical camp at such a level which is first of its kind in the district and said that the camp will be held for two days where a large number of patients will be given free consultation and treatment by the specialist doctors. Dr Singh in his statement said he will take up the matter of giving the status of “Heritage College” to Govt Degree College Bhaderwah as it is among one of the few colleges of post-independence India. On the demand of MLA, Dr Jitendra announced a digital X day machine for SDH Bhaderwah.Gupta directed CMO Doda to prepare a list of doctors and other paramedical staff required in various health institutions of the district and send the list for its submission to Health Minister.MOS Shakti Parihar stressed on overall development of the Chenab region and said the Govt is working on exploring the feasibility of creating modern infrastructure and strengthening of the administrative setup in the district.MLA Bhaderwah thanked and congratulated the Army for choosing Bhaderwah as the venue for Multi specialty medical camp. 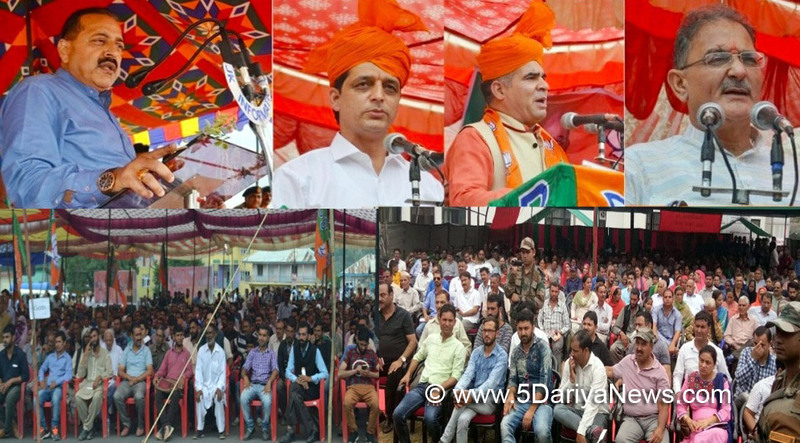 He said that the main agenda of his working is to provide better facilities to the people of his constituency at their doorsteps.The Ministers later interacted with the public and held a public grievance redressal camp at Community hall Bhaderwah.A number of deputations from various areas of the district put forth their demands before the Ministers which includes maintenance of roads, posting of adequate staff in education and Health Deptt, augmentation of drinking water supply, improvement in electricity, availability of items of basic necessaries etc.The people also demanded allotment of additional subjects in University campus Bhaderwah and placement of specialist doctors including Gynaecologist & Radiologist in Sub district hospital Bhaderwah.The Ministers took a note of the demands of public and issued directions for immediate redressal of the grievance by the district administration.